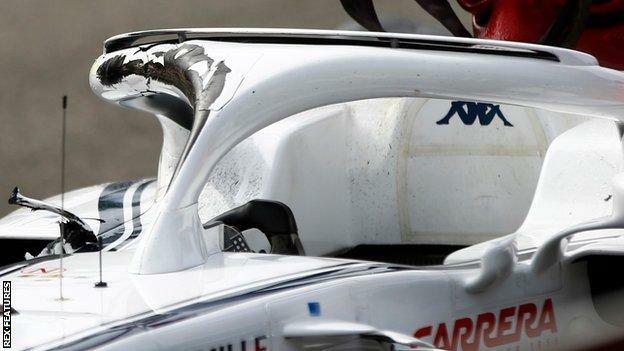 Fernando Alonso said F1's 'halo' head protection may have saved Charles Leclerc in their huge crash in Belgium. 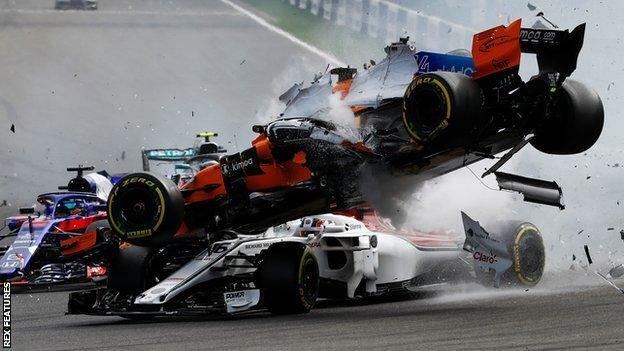 Alonso's McLaren landed on top of Leclerc's Sauber after being launched into the air by Renault's Nico Hulkenberg, who missed his braking point at the first corner at Spa. Television replays show Alonso's car being deflected by the halo, which had impact marks on it afterwards. "I saw the replay and how good was the proof for the halo," Alonso said. "We didn't need any proof but it is a good thing." The halo was a controversial introduction to F1 this season, with a significant minority of the drivers feeling it was not needed and many fans objecting to its appearance. There was also a feeling in some quarters that it was diluting F1's ethos as an open-cockpit formula. Alonso, who was among the majority of drivers in favour of the halo's introduction, added: "The positive side is we are all three OK, especially Charles. I flew over his car and the halo was a good thing to have today." Leclerc added: "If today it has been useful or not, I don't know. I don't know what would have happened without it but in some cases it is definitely helpful." Later, he posted an image of the accident on Twitter and wrote: "Never been a fan of the halo but I have to say that I was very happy to have it over my head today." Hulkenberg was handed a 10-place grid penalty at the next race in Italy this coming weekend, as well as three licence penalty points, bringing his total to four of the 12 permitted before a race ban. 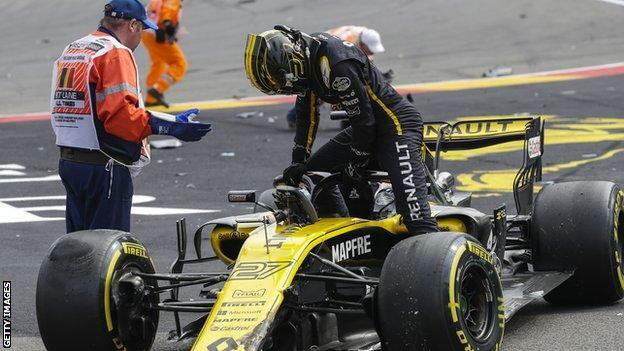 Hulkenberg said he was "disappointed and frustrated" with himself for the incident. He added: "I don't want that for myself, for Fernando, for everyone. It is a shame and very bitter to take that and difficult to swallow and be out in lap one after the summer break. "It caught me by surprise. I just misjudged my braking point a little bit and there was no real time to recover it." Alonso likened the incident to the one at the same race in 2012, when then Lotus driver Romain Grosjean was given a race ban for causing a similar incident, in which the Spaniard was also innocently involved. Speaking before Hulkenberg's penalty was announced, Alonso said: "That time Romain had a race ban. This time, we'll see. It is tough to understand how you can miss [your braking point] so much. "It is not a couple of metres, you arrive at a speed that it is impossible to negotiate the corner. So, sad for that but happy that we are all fine." The stewards took into account the Grosjean incident but pointed out in their verdict that at the time the penalty point system had not been introduced. FIA F1 director Charlie Whiting said: "I think it would be a little bit speculative [to say a serious injury had been avoided], but you can see it doesn't take much imagination to think that the tyre marks could have actually been on Charles' head. "What is clear is the significant tyre marks on both the tyre and the halo. We take a lot of photographs, and our researchers will be contacting Sauber on Monday morning to make sure we understand, for example, when they take the halo off, to see if the fixings and the bolts that fix it are in good shape, and more importantly to see if it's been distorted. It's being held in by the bolts at present, but see if it springs into a different shape. "Let's hope we can try and learn whatever we can from that. Looks like it's had a fairly hefty whack though."